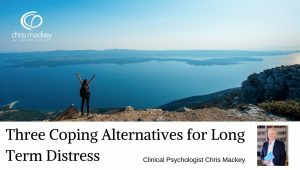 Clinical psychologist Chris Mackey discusses three coping alternatives for dealing with ongoing distress associated with a difficult situation, such as problems in a job or relationship. The three basic coping alternatives are: change it, accept it, or leave. It is often best to first try to improve the situation. However, if serious problems persist despite your best efforts, it can be worth looking to other coping alternatives.